Will Smith celebrates during a game against Arizona on Jan. 16, 2010 during a playoff game at the Superdome in New Orleans. Ohio State lost an All-American Saturday night, as Will Smith, who played defensive end for the Buckeyes from 2000-2003, died in a shooting in New Orleans. 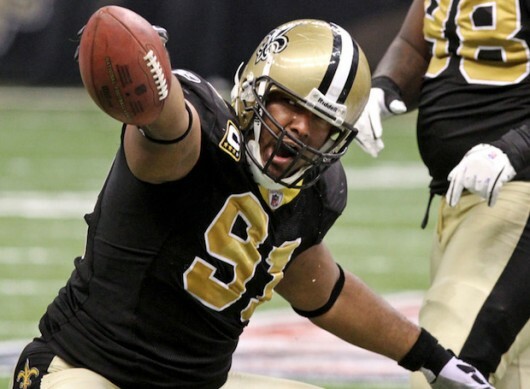 Smith, who was 34, was involved in a traffic collision around 11:30 p.m., NOLA.com reported. After the fender bender, he was shot inside his vehicle following an argument. The shooter, 28-year-old Cardell Hayes, has been booked on second-degree murder charges. Smith was a captain and on-the-field standout of OSU’s 2002 national championship team, picking up eight tackles in the national championship game against Miami (Fla.). Upon graduating from OSU, he was drafted 18th overall by the New Orleans Saints, where he played 10 seasons. He made the Pro Bowl in 2006 and won a Super Bowl in the 2009 season. He finished his career with 457 tackles, including 67.5 sacks. Smith leaves behind his wife, Racquel, who was with him during the shooting, and three children. After the news came out early Sunday morning, several former Buckeyes took to Twitter to express their grief. My heart and prayers are with @iWillSmith and his family. Life is precious. Stop the violence! Jesus and peace are the answers! !#Buckeyes ?? My heart is broken ??? R.I.P to my former teammate & friend Will Smith!!! My condolences goes out to his family! You will be missed ??? ?